I feel like the money I spend at the produce market shouldn’t be included in my grocery budget. I think of it more as a health care plan. Okay so it’s a pretty expensive health care plan. Yesterday my daughter and I made oatmeal chocolate chip cookies. Aside from the fact that they are now staring at me from across the kitchen, I am happy that we took the time to bake them. When I was young all of the treats that we had were homemade. My mom was an amazing baker and considered store bought cookies “trash”. Cookies, muffins, bars, loaves and scones. Yummy. Oatmeal chocolate chip cookies were definitely a favorite for all of us and disappeared quickly. I remember my mom attempting to slow down the cookie consumption by putting them in the freezer. Wrong. That just made them better. We should really bake more often. It’s easy, it’s fun and it creates great memories…..but it also creates situations like this. Me sitting in the kitchen being stared down by a plate of cookies thinking about my mom. The Best Thing in Life is fresh oatmeal chocolate chip cookies. Miss you mom. Just after Christmas last year my husband, daughter and I were in Victoria for a little get away. We had done a lot of walking and sightseeing during the day and it was getting late. And I was hungry. No, I was hangry. You know. When you are so hungry that the lack of food causes you to become frustrated, snappy and well, bitchy. We found a cool pizza place for dinner and as we walked in we noticed that all of the staff were wearing t-shirts with the slogan. My seven-year old looked at me and smiled and my husband said. “You need that shirt.” What? Okay, so I get a little cranky if I’m not fed quickly enough. Have you seen the Snickers commercials? But who doesn’t? It’s pretty normal I think. Okay, so I may take it a step too far occasionally. Really, is it so hard to just get me some food when I need it? I’m not a fussy eater so it could be pretty much be anything, so long as it fills my belly. The whole thing is just basic biology. Here’s what is happening in your body when you get hangry. Despite the fact that your brain is only 2% of your body weight, it uses up 20-30% of the energy you consume. So when your glucose levels are nose diving your brain starts to struggle with controlling emotions. Since anger is the emotion that most people have difficulty regulating, it tends to be what goes first. And you get hangry. In my younger, not so wise days, I thought that the longer I could go without eating the better. It meant I had will power and didn’t need food. (Don’t shake your head ’cause I know you did it too). Now I’m not talking about starving myself. Well, actually I guess I was. I just didn’t know any better and thought it was good to be a little hungry. I might even lose some weight if I could do it for enough days in a row. This may explain a few of those temper tantrums my mom has told me about. When I started seeing a naturopath a couple of years ago one of the first things she did was test my blood sugar. It was probably close to 10:30 in the morning. I had eaten breakfast but was feeling a little rumble in my stomach. No big deal right? “That was three hours ago. You need to keep your blood sugar between 4.4 and 6.1. I’ve learnt a lot in the last year and a half about what my body does and doesn’t need to not only function, but function well and my hangry episode are getting fewer and farther between. My family may get me that t-shirt from the pizza place but the Best Thing in Life is that they will still love me. 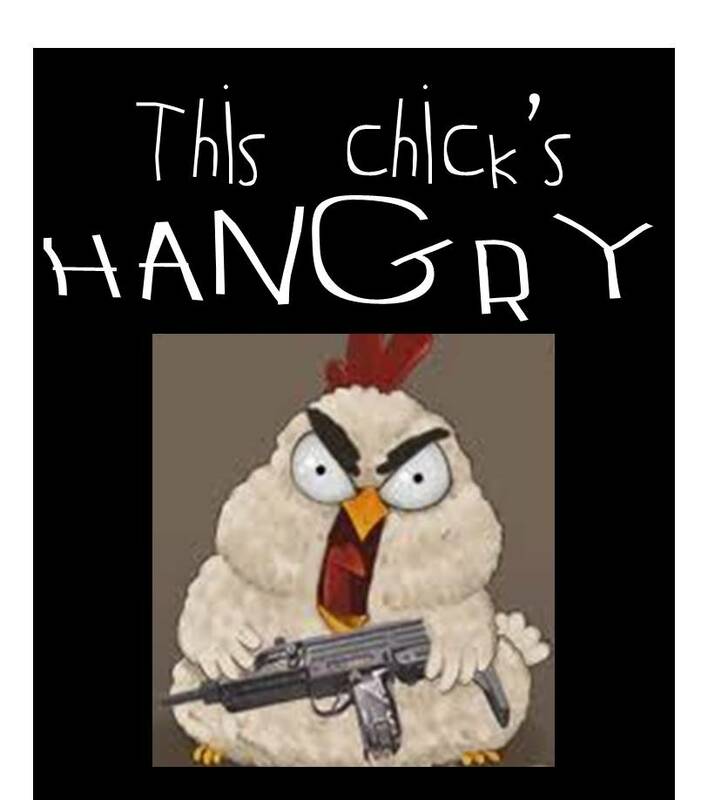 Hangry or not. FYI – Rungry is the term used when you are so hungry from a long run that you must eat everything you see. But that’s a whole different post.